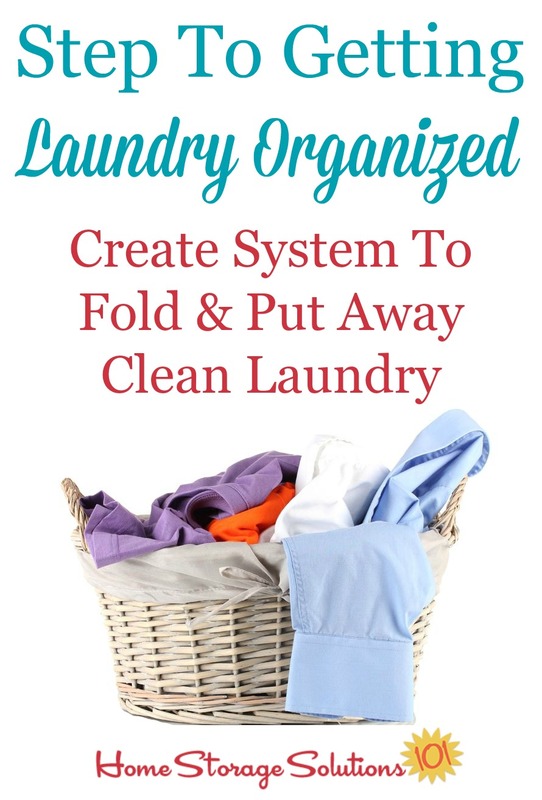 Today's mission is to create a system to put away laundry that is clean, to complete the laundry cycle and keep piles of clean folded (or unfolded) laundry or baskets of clothing from being constant clutter in your home. In this article we'll explore potential causes for this problem in your home, plus solutions to fix it. 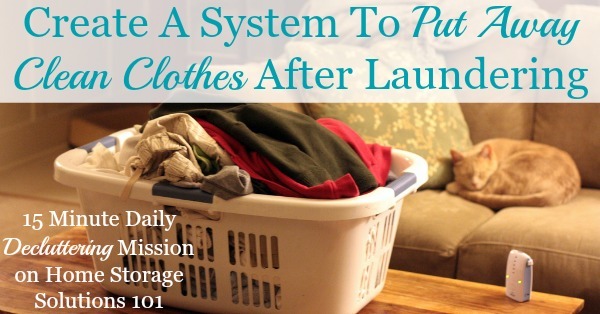 This mission is designed to be done while working on the Laundry Organization Challenge here on the site, which is one of the 52 Week Organized Home Challenges. When I think of an organized laundry system I think of one in which all the steps of the laundry cycle get done, from the beginning to the end of the process, without any bottlenecks that cause inconveniences to you or your family in between. That means dirty clothes get into hampers, so they're not scattered all over the floor or the house, then from the hampers they get sorted and washed and dried, and then the part of the cycle this article deals with is that they then get folded and put away. The laundry cycle is not complete until the clean clothes are either hung up in the closet or put away in dresser drawers. Until then, while they're in baskets, piled on the couch, or laid on the floor of the bedroom, they are essentially acting like clutter! Does the scene above look familiar? I know it has looked like this in my house on many occasions, although in this picture, courtesy of a reader, Shannon, at least all her clean clothes are folded. I've actually been further behind in the laundry process even more than that, with instead all the clean clothes dumped straight onto the couch from the dryer, still unfolded. Yep, I know everyone. Life (and laundry) happens. The purpose of this photo above is not to make you feel bad, or to feel shame because your laundry isn't put away all the time. I don't expect that of myself, and I don't expect it of you. Heck, you've got to put it somewhere while you fold it, don't you? What I do want, however, for everyone, is for us to all figure out a system, for ourselves, to keep those piles of clean clothes out only for a limited and reasonable time. That's because when the laundry isn't put away, in a reasonable time, it is clutter, since it is robbing you of time and energy. How does it do that? Here's how. Plus, while all that clean laundry is sitting on the couch, or the basket is on the floor, it is taking up room, making it inconvenient to use the couch for its intended purpose -- sitting, or you're tripping over baskets. In addition, if you are also having trouble getting the clothes folded after they come out of the dryer, you're also most likely wasting time and energy either rewashing clean stuff, since it is getting thrown on the floor and getting mixed in, again, with dirty clothes, and/or wearing rumpled and wrinkled clothing, which may not make you feel as good about yourself as you deserve to feel. I hope I've convinced you by now that clean clothes that aren't put away, within a reasonable time, are clutter. So now how do we fix the problem? Part of the reason that this problem, of not putting away the clean laundry, is so vexing is that even if many of us suffer from it, the reasons we suffer from it are not all the same. That's why when someone gives you guidelines and tips guaranteed to get your laundry organized, sometimes those things will work for you, and sometimes they won't. It depends if the guidelines and tips actually address the root problem causing you to not get your clean laundry put away, or not. But don't get discouraged. Below I've listed what I've found, over time, are the two major reasons many of us have this problem, although there are almost endless variations of theses two themes. Problem 1: You have too much clothes clutter, making it difficult to find space to put away the laundry, which means it doesn't happen. Problem 2: You feel overwhelmed by the sheer amount of laundry you've washed and dried, and have no energy left to do the last couple steps to finish the task (and perhaps family isn't helping). You might have only one of these problems, or you might be suffering from both, but you've got to address any of the problems you've got to make sure you can actually begin putting away your clean laundry consistently. If you've got way too much stuff in your closet or your dresser, and physically it is difficult to shove more clothes into the space, you are less likely to actually put your clothes away. That is basic human nature, we avoid doing things that take too much effort. You may not realize this is the problem until you really think about it, but if you realize clothing clutter is a real problem in your home, once you've decluttered clothes you might be amazed that your problem of clean laundry staying out for an unreasonable period of time goes away too. There are quite a few resources here on the site to help you with decluttering clothes, but I'd start with these 9 questions to ask yourself when decluttering clothes, to help you feel comfortable deciding for yourself, or your kids, what to keep and what to get rid of. In addition, here's my article on how to declutter dresser drawers, which discusses specifically decluttering folded clothing in clothing drawers. Further, if you feel like you've decluttered as much as you can, but you're still struggling to find space in drawers, you may want to reconsider how you're folding and placing your clothing into the drawers. You'll find that if you fold clothes and place them in drawers like "files" that they take up far less space. This can also help make putting away clothes easier (not to mention finding clothes inside the drawers easier as well). The solution to problem number 1 above, having too much clothes clutter, is pretty simple. Declutter. On the other hand, if you suffer from problem 2, being overwhelmed with too much laundry, some of the solutions I'll mention below are simple, while the last one is more complex. The simple things involve changes you can make personally to make it easier on yourself to get all the steps of the laundry done. The other solution involves changing other family member's behavior, which as you know, is what makes that solution more complex. So let's start with the easier solutions, and work our way up to the more complex one. 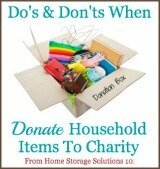 Decluttering your clothes, which was the solution to problem 1 above, actually can help you with problem 2 as well. If your household, overall, has less clothes, that means less laundry to wash, which means it is all less overwhelming. I know for myself, and also what I often hear from others, is that it took so much time and effort to gather up the dirty clothes, sort and pretreat everything, and then get all the loads washed and dried that once all those steps were done they're bushed, and there's no time or energy left to do the last few steps. Been there, done that. Have the (unfolded) t-shirt (laying on the couch) to prove it. First, address some of the issues like gathering dirty clothes, which was the discussion in yesterday's mission. Ideally you want to set up a system of hampers in the right places around your home that make it easy to not even think about gathering dirty laundry. Instead, it is already pre-gathered, for you, as people take off their dirty clothes and throw them straight into the dirty clothes receptacle. If you're really getting fancy with your laundry organizational skills, you might even have everyone sort as they go, by using a laundry sorter as your hamper, for example. But once you're not overwhelmed by those steps, just the process of washing and drying multiple loads of laundry all at once can be exhausting. Especially when you then have to look at multiple loads worth of clean clothes to fold, and then put away. You know I'm all about small steps, and I whole-heartedly think that if you're having problems getting your clothes put away you should consider doing less loads at one time. Many people have told me that they actually solved this problem by making a rule for themself -- they could not start a new load of laundry in the washer until the load that was in the dryer was folded, and then put away. That can seem a bit drastic, especially when you've got lots of clothes that need to be washed, but think about it. They were basically forcing themselves to space out the laundry process so it was less overwhelming to them by making that rule. It is much less daunting to sit and fold one load of laundry instead of 12, or to put one basket away instead of five baskets full. Doing less loads at a time, but on more days, such as with a daily laundry schedule, can help you space out the process and let you get it done with the time you have available on a day to day basis. You won't be as tired after one or two loads, and can muster the energy necessary to finish all the steps of the process without being overwhelmed. If you really want to (or have to) do marathon washing sessions though, instead of spacing it out as suggested, you still can help yourself by making sure you plan for a long session of folding and putting away on that same day, or the day after. You might plan, for example, to watch a movie while you fold and then pause periodically to put things away. The point is, don't give yourself only enough time to wash and dry, but then somehow expect miraculously that you'll find time to fold and put things away unless you actually make time for those additional tasks. You can check out this article on finding the right laundry schedule for you for more details. Finally, we now come to the complex solution to getting your laundry put away consistently, and within a reasonable time -- getting your family to help with the laundry process. Life is busy, and whether you want your family to help because that's fair, or also desperately need their assistance because no matter how many organizing tricks you employ you just don't have enough hours in the day to get everything done, family involvement in the entire laundry process is the most effective method of getting laundry put away consistently. If everyone cooperates and helps keep the system moving along it is so much easier for everyone! Unfortunately, training everyone to assist is not always easy. But trust me, it is worthwhile, and while it may cause more work in the short term it will save a lot of work in the long term. Some of the things we do in our house to get everyone involved in the process of laundry include having everyone put their dirty clothes into hampers consistently, bringing down bags of dirty clothes for the wash, helping sort, moving clothes from the washer to the dryer, and from the dryer to the folding area, and then, we often have a folding party. What's a folding party? A time we stop everything else and sit down on the floor in our living room, which is close to where my washer and dryer are, and fold clean clothes. We often talk and joke while we fold, or if there's a lot to do we may watch TV or listen to songs, but the point is that we work as a team and get it done. And then the rule is, it's not done until not only the stuff is folded, but is also put away. As we fold we separate each person's clothes into their individual stacks, so at the end each person can carry up their clothes and put everything directly into their dresser drawers. We also make sure all the towels, bedding, dish towels, and more, are put away as well during this process. If your kids don't remember where their clothes go, and want to shove them any old place, I suggest labeling the drawers, like a reader, Emma, did. She's the one who sent in this photo to the left. 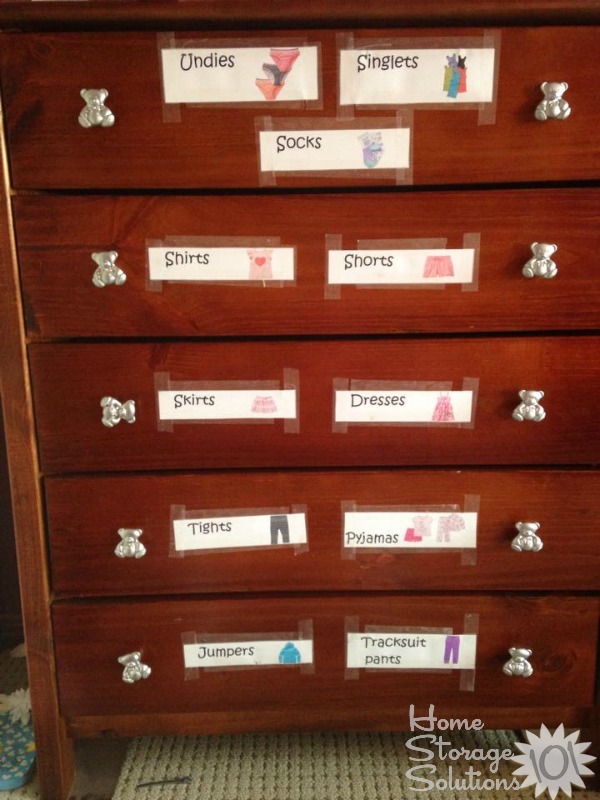 In fact, labeling your clothes drawers is such a popular idea among readers I've written a whole article on how to use drawer labels to organize folded clothes here which you can read for more instructions. If some family members are not home, right then, to put away their clean clothes once you're done folding you can either choose to put them away for them, or you'll need to make sure you follow up later to make sure they did put them up, usually before bed that evening. If they know where everything should go, and there's enough room to put items in that space, then putting away clothes is one of the easiest and quickest chores there is, and it is more likely to get done. The final step in today's mission is not only to create a system to put away clean clothes after laundering, but to develop the habit to do it consistently from now on. As simple as it sounds, once you've identified your problem areas and taken steps to correct those problems, all you need to do thereafter to make it a habit is make a committment to getting it done. Sure, life happens sometimes. But all of the efforts you took were done to make it take very little time to actually put away the clean clothes so even if you don't have time right then to put everything away, you can find the 15 minutes it takes somewhere, at least by the next day. In addition, you'll find once you're not dealing with clean clothes clutter all the time your living spaces are much more pleasant to be in, and you'll save time getting yourself and your kids ready each day, so you'll have several great incentive to keep it up and get those clothes back into their rightful spot on a day to day basis. 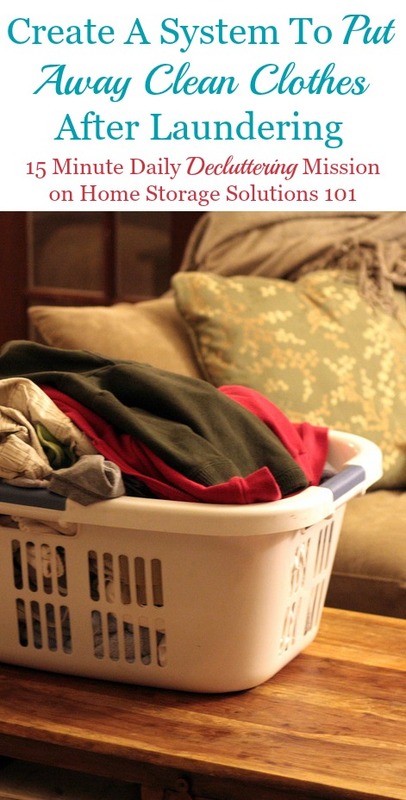 I hope you're now inspired to get your laundry and home organized and decluttered.